Fun. What a concept! It’s a concept you don’t hear much in music nowadays. Weird Al Yankovic? That’s more like comedy and parody. We’re talking about musical fun, for the joy of it. 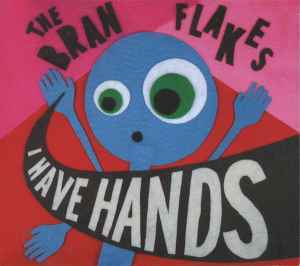 …and that has been the cornerstone of The Bran Flakes for years: Fun! Especially with their first new CD in six years, I HAVE HANDS. Being that they are a found sound/collage band, there’s plenty of mash-up/sample details to get into here. For example: ‘Stumble Out Of Bead’ contains fragments like Dolly Parton’s 9 to 5, the intro guitar lick from Eye Of The Tiger and ELO’s iconic drumbeats from Don’t Bring Me Down. However, dissecting each of these tracks seems to cloud the intention here: ‘fun’….put to a drum beat, that is. With tracks like ‘Don Knotts’ (a chirpy interlude that repeats the fine actor’s name, enough to take you dizzy), ‘Singing Dogs’ (a up beat techno alternative to that other Singing Dogs of the 50’s hit single Jingle Bells fame), ‘Do You Want Salad With Your Taco’ (short electronic ditty that abruptly end with a fart) and ‘Jump Up’ (forget the description…the title alone…) reflects and reinforces the group’s sincere sense of fun. Another fun highlight has electronic pioneer Raymond Scott getting the fun Flakes treatment with the fun track ‘Mini Mountain Queen’. Am I wearing out this ‘fun’ word out yet? Well, in that case, I won’t spoil the you-know-what for you. I’ll just stop here by saying pop this into your audio player and have some…..um, oops, sorry….